In this series of articles celebrating the upcoming 30th Anniversary of Super Mario, various members of the Nintendo Life extended family will share their memories and thoughts on the iconic franchise. This time we have reviewer and guide extraordinaire Dave Letcavage. I'm not sure of my exact age at the time, but toward the end of the '80s my dad moved a 13" television into my bedroom – and with it came our NES. Since he hadn't yet beat Super Mario Bros. 2 he'd hang out in my room every now and again trying to beat it. As much as I loved playing video games, I had no problem sitting back and watching someone else play. In fact, I genuinely enjoyed participating as a spectator. Not having to worry about jumping around and franticly avoiding enemies meant I could sit back and soak in the spectacle, which allowed me to closely analyze and observe the finer visual details. I found video game worlds so magical and fascinating, and Super Mario Bros. 2 was one of the weirdest and most visually compelling games I'd seen at that point in my life. It wasn't until Mr. Thomas Whitehead reached out to me about contributing to this series that I realized the lifelong impact that the (SPOILER ALERT) dream-induced world of Subcon had on me. Being like most other kids on the planet – pre-internet access, at least – I'd spend a lot of my free time with art supplies in hand. It started with rudimentary stick-figure-like illustrations of my family, dog, and home, until my focus almost exclusively shifted to animals. At first I tried to draw various animals in a realistic manner, but my skills were way too lacking for that. So, due to the limitation, I put my own spin on it and instead took a cartoony approach. I was about five or six years old then, so believe me when I say these drawings were nothing overly creative or special … but I was getting there. 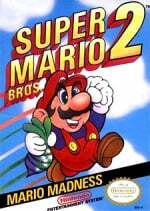 Then came Super Mario Bros. 2. Not long after the NES was moved into my bedroom, I was flipping through the Super Mario Bros. 2 manual while my dad was immersed in the game. If you're familiar with instruction manuals from the NES and SNES days, you'll know that it was common for unique hand-drawn art to be littered throughout the pages. It was that level of presentation that added value to those otherwise uninteresting instructions, and it's why you often hear '80s kids bemoaning the near extinction of manuals in the current market. In the case of Super Mario Bros. 2, it was the detailed illustrations of the game's cast that captured my attention. They were so bizarre and charming, and they provided me a better image of what those blocky 8-bit characters actually looked like. Most importantly, these illustrations were much easier to emulate than real-world subjects were. So one weekend afternoon, while my dad was settling in to make a run at Wart, I busted out my art supplies and decided to do a bit of doodling. Between the illustrations in the manual and the game being played on the television, there was plenty of inspiration within view. I ended up studying the characteristics of the common enemies and bosses very closely and began drawing them. 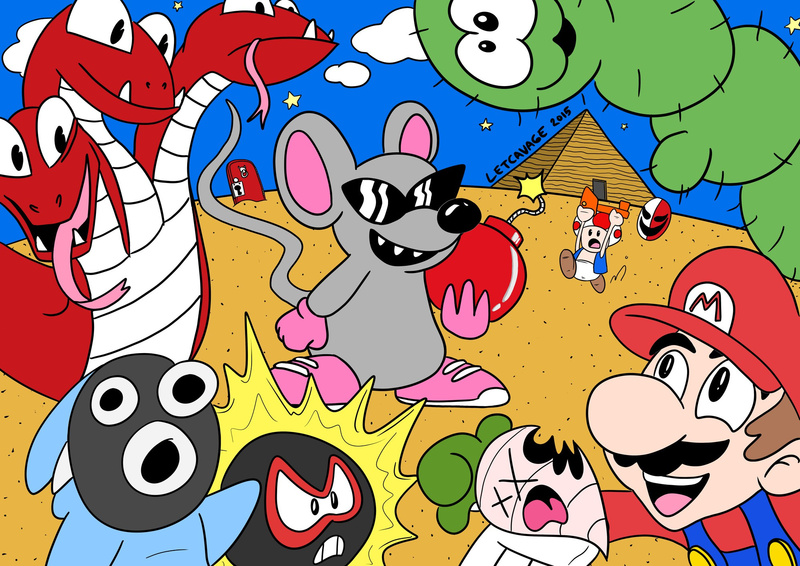 Mouser, Birdo, Tryclyde, and Porcupo are a few of the characters I recall having a fondness for, and it wasn't long before I'd drawn each of these baddies on their own piece of paper and colored them in with Crayons. After that, I tracked down some scotch tape and hung each drawing on my bedroom wall. In the days following my initial art session, I continued to draw the rest of the "bad guys" from Super Mario Bros. 2, and about a week later the majority of my bedroom wall was covered in a dense layer of tape and paper. By then I'd ran out of characters to draw, so I decided to create my own critters and creatures that would blend in with the entire cast hanging on the wall. The result was a concoction of the animal types I used to draw, but with a dose of the imagination I gained my newfound inspiration. That was right about the time that art became more than just a way to escape boredom; it become a hobby that I wanted to explore very thoroughly. Thanks to Games Database, you can view the entire North American Super Mario Bros. 2 manual in PDF form by clicking here. That's funny... For some reason the manual of SMB2 was the most memorable one of my childhood (and I read hundreds). Ah, back when Birdo was a transvestite. @GeminiSaint I always thought that was a nice thing... Too bad they just hide it nowadays. That said, I remember drawing several Pokémon characters and Rayman with a friend of mine when I was little. Such a nice time. Now I'm old. SMB2 theme should be in Mario Maker ahead of the charmless NSMB stylings. I wish I saved all of my instruction manuals from the good ol days. Such nostalgia. Those drawings show you a great example of how Nintendo could do a classic old school looking 2D Mario platformer but with full HD graphics and no pixelation. I think a new Super Mario Bros game that looked like that would be awesome. Awesome write up as always. @SmoochyTea I don't really see it as them hiding it. More like Birdo is now fully transitioned to female, I guess. @DRL Yet another inspiring memory you've shared. Thanks again! To all those wishing for Super Mario Bros. 2 to have been represented in Super Mario Maker, you have some great imaginations, as that would be awesome! Unfortunately, so many enemies would have to be created for this in Mario Maker that it just wouldn't be a worthy investment for Nintendo's time (and let's not forget the strinkingly unique gameplay that SMB2 bore in comparison to its brethren, either, which would likewise feel out of place in the Wii U game). Nintendo should definitely revisit the world of Subcon and all its intracacies in a brand new game, though. I love all the old drawings of Mario in the manuals from this era. My favourite is the fold-out map/instruction booklet that came with the Japanese version of Super Mario World. I got really adept at drawing Mario in my school rough books back in the day. I personally don't like the 3D pre-rendered Mario that Nintendo use for everything these days. I'd love to see a modern Mario game done with cel shaded graphics that look like the old instruction manual art! Birdo used to be called Ostro? It is a shame that the manuals that are released nowadays pale in comparison the the ones from way back when. I distinctly remember reading the manuals from NeverWinter Nights and Morrowind, and Diablo 2 and becoming so infatuated with them that I would almost always start up a new game every time I looked at them. Heck, just seeing the boxart made me want to go on an adventure in their worlds and very few games have replicated that feeling since. I still have those booklets and still love them but I can't help but want modern manuals to be as well-made as those examples. Times have changed though. I miss nintendos instruction manuals from 80s 90s. They were true works of art enhancing the games. I always found nes and gameboy manuals fascinating. I would always read the manual before starting the game for the first time. Though the illustrations were quirky and to me they often came across as amateurish. Sometimes the art just didn't seem to match the sprite's function or intention. Like it was drawn by someone that didn't understand the game. @Trinexx I'm pretty sure the Birdo/Ostro thing was a mistake, there's an ostrich enemy in SMB2 as well, so i think they got the pink egg-spitting bird mixed up with the... well, the ostrich, common mistake i suppose due to the staggering resembance. @Kirk I completely agree. I hope Nintendo gets more ambitious with its next 2D Mario. There's a lot to learn from the recent Rayman and DKC games when it comes to organic level design and immersive, distinct visuals. I'd love to see similar things done with Mario in the future but with some sort of genuine mechanical evolution. @Splatburst @Gauchorino Thanks for the compliments! Hahaha, nice to see that I'm not the only guy whose art education was basically video game manuals (and Donald Duck comics, I guess). If that drawing is any indication, you're a fair sight better than I was though. You captured the essence of Mario better than most super-advanced, hyper-realistic fanart I've seen. Oh how I miss game manuals. I've had a similar source of artistic inspiration with them when I was a young'un; except they were GBA and Gamecube ones. All the Mario, Metroid, and Sonic games from back then had fantastic artwork in their manuals! Man, I remember that section of that manual vividly. I remember saying to myself, "I wonder how Wart looks in the game. Maybe he doesn't even look like his artwork,' I thought. Memories. SMB2 was a different beast whether by design, accident, or designer decision, But it was the Mario game that gave me the impression that every Mario game from here on out was going to introduce a new set of enemies, worlds, gimmicks, power ups, etc. Sadly that wasn't quite the case as Mario continued to return to the tropes of the original SMB and kept redefining them (though I'm not complaining). I will forever love this black sheep of the Mario lineage.